I set up a subdomain to test gmail and some other things (WordPress). At DH Panel>Manage Domains> edit, I clicked on Google Apps following the steps in the DH wiki. Then I hit the link to set my domain up with Google. Went through all the steps registering with Google, going along fine, but then Google wanted me to verify ownership of the domain. 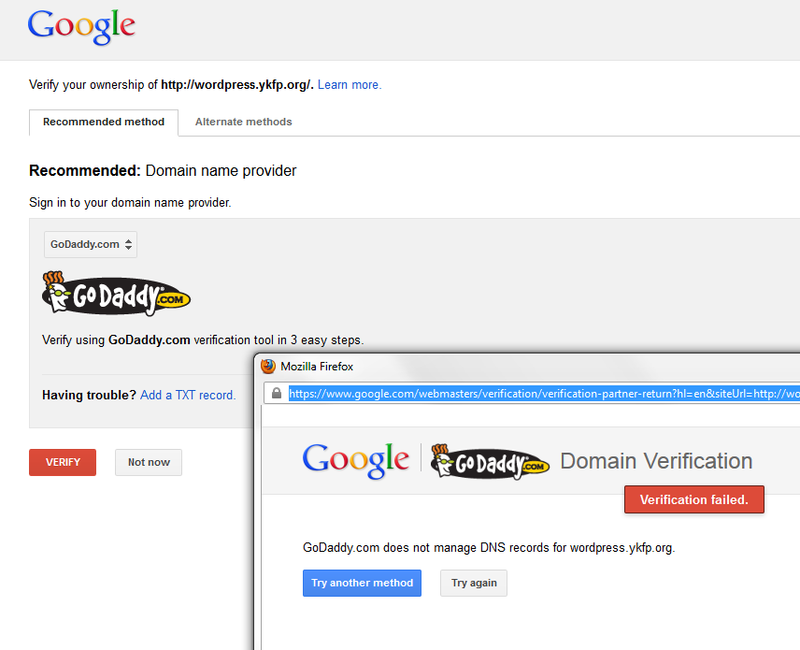 My domain registration is with GoDaddy, so I followed the link from Google to GoDaddy, signed into my account, but GoDaddy is telling me my subdomain is not registered with them. Just for testing, should I register the subdomain with GoDaddy, or can I somehow just verify that I’m the owner of the domain? If your domain is hosted at DreamHost, follow Google’s instructions for using a DreamHost domain, not the GoDaddy instructions. The fact that they’re the domain registrar is irrelevant. I got it to work by opening Google’s Alternative methods tab, uploaded an HTML file to the subdomain root directory, then the red Verify button delivered success. What options show up under “Alternate methods”? HTML tag, HTML file upload, Google Analytics. I used the HTML file upload. Sent and received a test message so it looks like it’s working. However, I’m not finding my test gmail Interface at http://mail.mytestdomain.org as described in the wiki http://wiki.dreamhost.com/Google_Apps#For_Already_Hosted_Domains “How do I access my mail with my regular e-mail client now?” I got to my Gmail interface by logging into mail.google.com and switching to the my new test email account. Does the wiki need updating? I’m going to have a bunch of POP3 clients to change so it would nice to have some clear instructions so some users will be able to change their own Thunderbird settings.